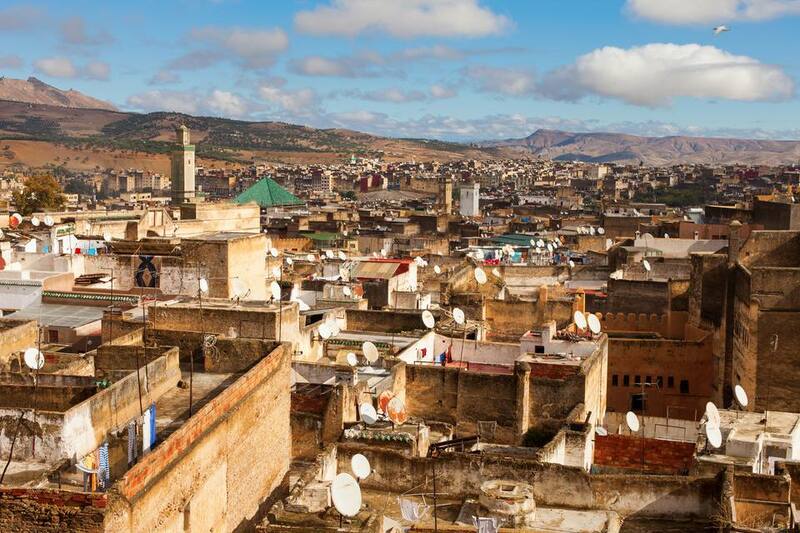 Do You Need a Guide to Visit Fes (Fez), Morocco? Fes is Morocco's cultural and spiritual capital and one of Morocco's top attractions. The Fes Medina (old-walled city), known as Fes el-Bali, is a World Heritage Site and the main reason people visit the city. Fes el-Bali is a myriad of more than 9000 narrow streets, lined with shops selling vegetables, carpets, lamps, leather bags, camel meat, nuts, and sundries. Every donkey you squeeze past will look vaguely familiar, and before long you'll be lost. In Fes, you are almost guaranteed to get lost without a guide. But that's not necessarily such a bad thing. There are food stalls everywhere, so you won't starve. There are fascinating little shops, fountains, and courtyards every square inch, so you'll never be bored. There are mosques and tanneries to visit, Riad's to marvel at, artisans to photograph, and mint tea to quench your thirst. You will no doubt be asked to be guided at some point, if you really want to stay independent, politely refuse and say you "know where you are going". Try not to ever take up school children on their offer to guide you especially if a tip is requested because it will only encourage other kids to skip school possibly in search of pocket money. While Fes is certainly more gritty and maze-like than Marrakech, there are two main alleys in old Fes, the Talaa Kebira, and the Talaa Seghir. Both end up at the main gate of Bab Bou Jeloud. If you get lost, head for either of these and ask for the direction of the Bab Bou Jeloud. The Bab Bou Jeloud is quite impressive, but it's the little square with rooftop restaurants right inside the gates, that you'll enjoy even more. Maps don't always help, local knowledge is better. To avoid attracting unofficial guides, ask established shopkeepers for directions to the main streets, or stop somewhere for mint tea and ask the owner where you are. Before long, you are bound to meet up with another lost looking group of tourists with a guide, and you can always ask them for directions (you may have to practice your German). Get a guide for your first day in Fes, especially if you have not traveled in North Africa very much. The official guides are very well-qualified historians for the most part, and will no doubt speak your language. They'll help you focus on the details that make this medieval walled city so unique. They can quickly get you to the main sights, especially the mosques, they are particularly beautiful here. A guide will also help acclimatize you if you feel a little overwhelmed in the bustle. Using an official guide will still mean that you end up in a leather shop, but this is the best way to see the tanneries. If you don't want to buy a gaudy pair of leather sandals, then just leave a tip. Once you've covered the tanneries and main sights, the fun of visiting Fes is discovering the non-tourist areas by getting lost.